Bunting begins to flap along Chatsworth Road. – Chatsworth Road Festival. Bunting begins to flap along Chatsworth Road. You know that the Festival is almost here when the bunting starts to flap along the road. We’ve found the trusty banner and it’s up on 479 Chatsworth Road. Ian Morris opened his window to let the banner elf clamber onto the half roof above Libbys and hang the banner. We did have two of these at one time but it’s a mystery where the second one went after the first year. 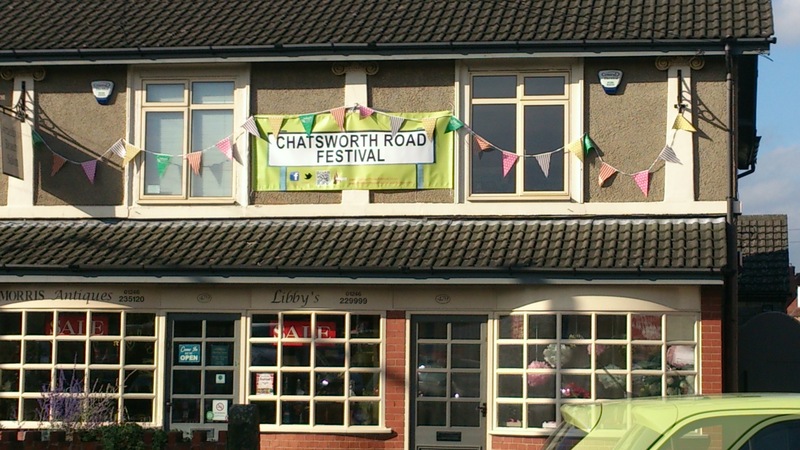 So if you find a banner in your cellar that says Chatsworth Road, hang it out this weekend.